Jinx on Solar Sail missons finally broken? Yesterday the Japanese successfully launched three Venus-bound spacecraft: the Akatsuki Venus orbiter, the IKAROS solar sail, and a University-built UNITEC-1 mini-satellite. In doing so it broke one of the longest running jinxes in spaceflight, it managed to sucessfully put a solar sail spacecraft in orbit. The last time this happened was in 1993 when the Russian Znamya-2 experiment, a spinning sail 60ft in diameter which was sucessfully deployed from a Progress vehicle after undocking from MIR. The followup experiment in 1999, Znamya-2.5, was a failure after the sail became entangled in a antenna during deployment. The funding crunch that then faced the Russian space programme meant that the ambitious Znamya-3 followup mission, consisting of a 200ft diameter sail deployed from another Progress craft, which was to fly in 2000 or 2001, was unfortunately cancelled. Around that time the Planetary Society attempted a sub-orbital launch of a prototype solar sail, a flight designed to test a new technology for unfurling solar sail blades, which failed due to a problem with the launch vehicle. The subsequent launch their Cosmos-1 solar sail vehicle in 2005, from a Russian nuclear submarine in the Barents Sea using the same Volna launch vehicle, also failed. Despite their initial optimism, their Cosmos-1 spacecraft did not achieve orbit. Despite this set back, the Planetary Society are still persevering with plans for a fresh mission called Lightsail-1 with a planned launch date around the end of the year. A similar fate to the Planetary Society's Cosmos-1 mission befell NASA's NanoSail-D mission which was lost in a launch failure during the third flight of SpaceX's Falcon 1 rocket in 2008. Despite the sub-orbital tests flown by the Japanese back in 2004, presumably as a pre-cusor to yesterday's IKAROS launch, it seemed that solar-sail mission just couldn't get off the ground. However, despite the apparent break in the curse associated solar sail missions, the Japanese have yet managed to deploy the sail. The IKAROS spacecraft is currently undergoing in-flight checkout before a scheduled deployment of the sail in a few weeks... fingers crossed. 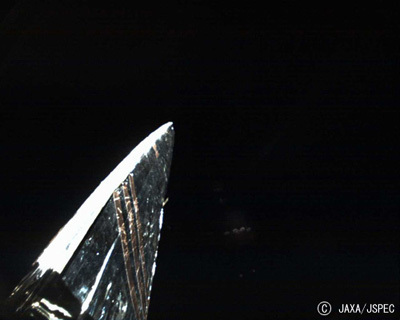 IKAROS first stage deployment halfway complete - A view from one of the four sail monitoring cameras on IKAROS on June 9, 2010 shows the folded sail being pulled outward from the spacecraft as it should be... (via the Planetary Society). 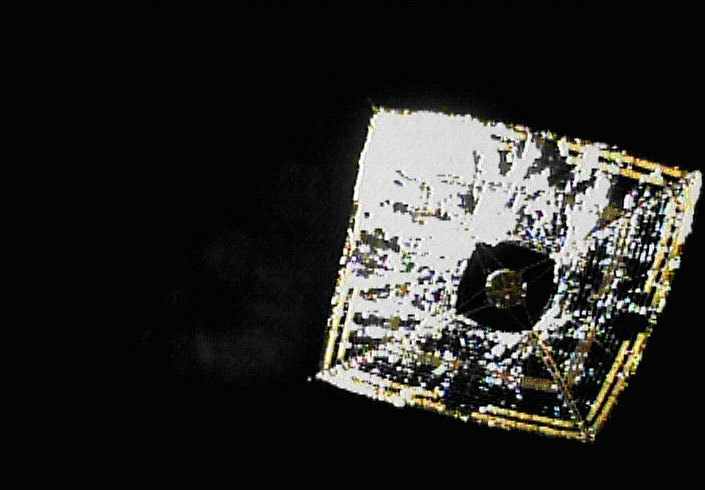 Update: JAXA are now reporting a successful full deployment of the sail, and that the sail's thin-film solar cells are now generating power. It looks like the curse is finally broken. Successful sail deployment for IKAROS (via the Planetary Society). 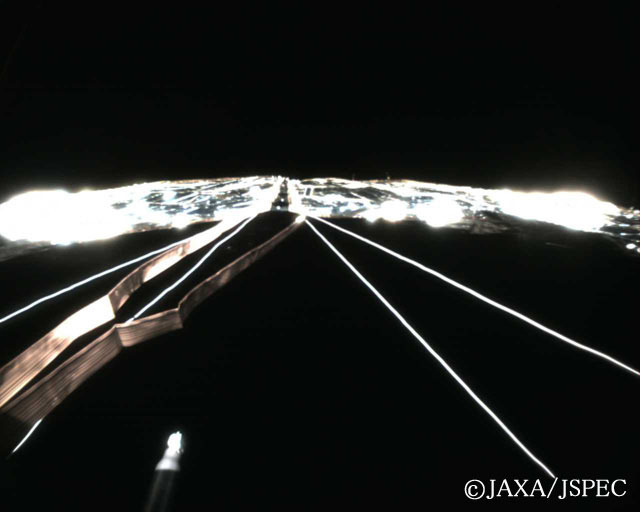 IKAROS sail from DCAM2 - One of the deployable cameras on IKAROS shows the IKAROS solar sail fully deployed. (via the Planetary Society).